If you are new to triathlon, the swim is usually the hardest part and selecting the right goggles can make this aspect easier for you. While you will find a vast array to choose from, don’t be swayed too much by their colour or style; their design features to aid your vision during the swim is far more important. Don’t waste your time in the pool by wearing ill-fitting swim gear. Tugging at a baggy swim cap can slow you down, poorly sized goggles can lead to irritated eyes, and loose fins can leave you with painful blisters. Thankfully, you don’t have to spend a fortune for custom sized gear. 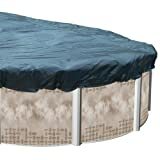 Keep your pool clean by preventing leaves and debris from getting in with this oval pool cover. Features deluxe-woven polyethylene with heat-sealed seams and locking cable systems to keep cover securely in place. For use on above-ground pools only. Care instructions: remove and store in dry cool place when not in use. Made in USA.